Take Classes at My LYS... Colorful Yarns in Centennial, CO.
We're excited about knitting and glad you are too! Sign up for a class or tell us you are interested in one by filling out a form below! 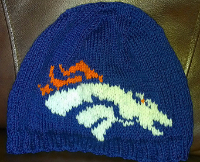 To sign up for one of Genevieve's knitting classes at Colorful Yarns (2001 E Easter Ave, Ste 101, Centennial, CO 80122), please select the class and click the "Buy Now" Paypal button below. Please sign up for my Newsletter to stay up to date on new classes I offer, new videos I publish, etc! Have a knitting problem and need some help solving it? Knitting Help Half Hour to the rescue! We'll do our best to help you out of your bind and get you back to knitting happily! Where: At Colorful Yarns in Centennial. Price: $15.00 for 1-30 min of dedicated time to fixing your knitting problem. This introductory course to knitting is perfect for anyone wanting to learn or review the basic skills of knitting. Whether you "learned a long time ago" or have never tried it, this class is for you! In this class you will learn the 6 basic knitting techniques: Cast On, Bind Off, Knit, Purl, an increase and a decrease, and also make a hat so you can show off your new skills! Want to learn how to fix common knitting mistakes? I’ll show you how they were created in the first place! You’ll also learn several tricks to prevent and move past mistakes, as well as techniques to keep you knitting while having fun building your knitting confidence. All levels of experience welcome! Cowl Knitting: Learn to do lace or cable and knitting in the round and produce a beautiful cowl that you or someone you give it to will get tons of joy out of this winter! You pick the cowl pattern or get help creating your own! Beyond Beginning: Now that you can do the knitting basics - knit, purl, an increase and decrease, cast on and bind off - it's time to step it up and learn the next level of knitting skills. How about cables? Or knitting in the round? Maybe some lace? I'll help you pick the project and soon you'll be knitting far beyond the basic scarf! “Genevieve is a fabulous teacher! Brand new to knitting, I first met her for a lesson where I was met with lots of easy to understand instruction and an easygoing demeanor...making the knitting session fun! Since that first private lesson, I have enjoyed a couple of beginner classes taught by Genevieve. She has a great way of explaining specific stitches/projects and various important things to consider. Genevieve is above all extremely knowledgeable, patient, kind...and always willing to go the extra mile to help." -- Debbie M.
"Genevieve has been my knitting "coach" for about a year now. She has helped me work through countless obstacles with my knitting projects and has inspired me to try new approaches, to look at my mistakes in a more positive light, and to not give up on bringing beautiful pieces to life. It's a joy to learn from her. " -- Amanda M.
I first started teaching knitting classes back in 2008 at The Recycled Lamb in Golden (and later Lakewood) and continued to teach until the shop closed in 2016. Now I am excited to continue teaching at the Colorful Yarns knit shop in Centennial (near the Southglenn mall). My teaching style is enthusiastic (I have lots of sound effects) and encouraging - I believe anyone can learn to knit, so long as they have the desire to do so! I've taught tight, perfectionist knitters as well as those who are afraid to make mistakes how to relax and utilize all the accoutrements to take the thinking out of the process and just allow the knitting creativity to flow. I also offer private and group lessons. Get more info about those here. Let us know about classes you are interested in.. NOTE: Classes are usually scheduled for 1.5-2 hour sessions on Saturdays and Sundays in the afternoons at Colorful Yarns and some weeknights from 7-8:30pm at the Southglenn Library. Only check this box if you really, really don't want to receive my infrequent newsletter email updates. I will still email about the class you signed up for and seek confirmation. Learn how to do intarsia/stranded knitting variation and add pictures to hats in back and forth rounds! You do not have to be a Broncos fan - any sports logo (or picture equally as simple) will do, maybe even a simple coat of arms or company logo. I saw these knitted animals for display in a shop window and knew I had to knit them all. They make amazing baby gifts!! The Amigurumi is a great knitting skill if you have the patience to knit several pieces and then assemble them. The best part is that each piece is small so it is very quick! You will learn so many increase and decrease skills as well as seaming - it will change how you knit sweaters! Learn the mysteries of how to cable! In this class you will knit a stitch sampler allowing you to explore 2-stitch cables on upwards to 6-stitch cables, mock cables, cabling without a cable needle, and fixing backward cables. Discover how to read stitch charts and cable abbreviations. After completing this course, you'll be able to handle any cable project with confidence and enthusiasm. Continental knitting, as opposed to 'English' or throw method, comes in handy when doing two-color projects. Some also say that it is the faster way to knit (I think it all depends on the knitter!). But perhaps you are curious or what to experiment with your stranded knitting. This class will guide you through all the tricks and give you good practice to master this other knitting style. Now that you can do the knitting basics - knit, purl, an increase and decrease, cast on and bind off - it's time to step it up and learn the next level of knitting skills. How about cables? Or knitting in the round? Maybe some lace? I'll help you pick the project and soon you'll be knitting far beyond the basic scarf! Learn to knit the stranded way, aka Fair-Isle knitting to make beautiful mittens. It's a small project, perfect for summer knitting and to give you a head start on holiday gifts! Learn to read color charts and practice knitting with DPNs (double pointed needles).